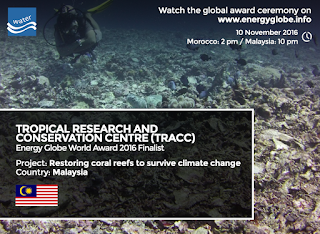 TRACC.org working on coral reef conservation in Semporna, Sabah, Malaysia has been chosen as WINNER in the Water category for 2016. We were nominated in 2016 as one of the three finalists in the category water for the Energy Globe World Award 2016. Thanks to the judges who had the difficult task of chosing between coral reefs and water shortages in Africa. The Energy Globe Award is an important award for sustainability worldwide. This year, EGA have received about 2000 applications from 180 countries. 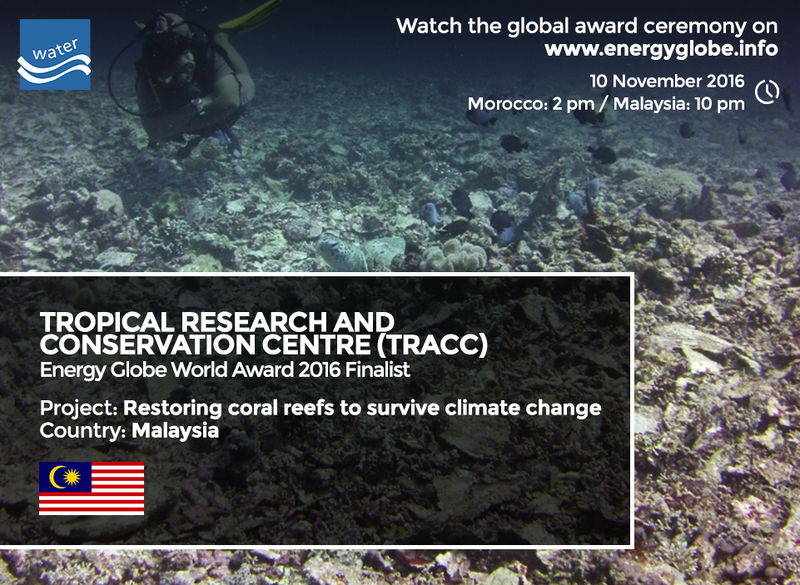 Out of the many great projects and inventions, the international jury has selected OUR project “ Restoring coral reefs to survive climate change ” as one of the 16 most outstanding projects worldwide. Our nomination in the final 3 projects for the category water was announced officially on 24th October on Energy Globe World Award 2016 website. The award ceremony will be part of the UN Climate Change Conference on 10th November in Marrakech, Morocco. THANKS TO ALL OUR STAFF & VOLUNTEERS AND COMMUNITIES, WE MUST BE DOING SOMETHING RIGHT BUT WE COULDN’T HAVE DONE THIS WITHOUT YOUR HELP. Saving coral reefs is what we do – with your help – so please pat yourselves on the back if you have helped TRACC and send a great big thank you :-) to all our supporters. If visits to Tracc are not possible then like us and share our projects on Social media. Donations to community projects, or support / sponsor an Intern or Marine science student are always welcome.